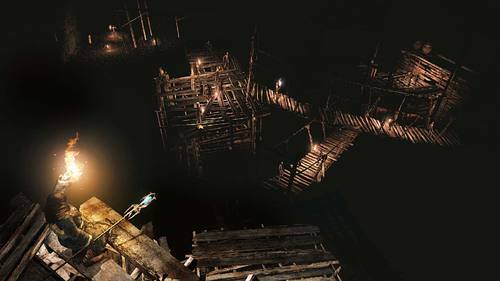 Deep within the earth beneath Majula lies an anarchic settlement of filth and chaos built by the forsaken souls cast into The Pit. This lightless hell is the resting place of all that the kingdoms of ages past wished to forget, echoing with the bitterness and despair of those who were thrown away. Deeper still, a dim bioluminescence radiates ominously from the mouth of a cavern avoided even by most inhabitants of The Gutter… Black Gulch. All manner of terrible things have been cast into the Gutter in Majula. Some of the more determined souls exiled to the Gutter sought to scale the walls of the forsaken place and walk the earth once again, but failed and wasted away, mired in misery and resentment. In a hidden cavern protected by vases full of poison is a chest containing armor known as Havel's Set. The armor appears to be made of metal, which makes it different from the stone armor of the great Havel of lore. Hunting Dog: A mutated canine born from the experiments conducted by Lord Aldia. Hunting Dogs are not a naturally-occurring species and are therefore only found in areas to which they were introduced by the Dragon Acolytes. A number of them were dumped into The Gutter over the course of Lord Aldia's research and continue to prowl its depths in search of anything that might serve as a meal. Corrosive Ant Queen: A queen of the species of giant corrosive ants native to Jugo. Only one exists in Drangleic; its presence in The Gutter seems to suggest that it began its life in the laboratory of Lord Aldia's mansion and eventually outlived its usefulness. "That gaping hole? Hell, search me. It's where the people round here toss all their rubbish. Corpses or you know what… Whatever they'd rather be rid of. Oh, and, and those human statues. Who are they supposed to be? Anybody, I suppose. Probably just some auld pagan custom. What's it like at the bottom of the hole? Why in the hell would I know! Hah!" "You've seen that gaping hole here? Well, there's nasty little vermin down there. Although who you seek is even further below. And has been down there for a very, very long time. He's plumb Rotten by now, I'm sure! Hee hee hee…"
"Have you seen that pit? That gaping hole in the earth. I don't know what it's like down below, but I wouldn't suggest trying to find out. Besides, you'll never make it down there, not without a ladder of some sort." Soul of the Rotten, who writhes deep within the Gutter. The Rotten embraces all, in his sanctuary for all things unwanted or tossed away. Use the special soul of The Rotten to acquire numerous souls, or to create something of great worth. An oddly large butcher's knife. Not your standard weapon, but certainly deadly enough to be utilized as one. Absorbs the HP of foes. Who in their right mind would create such a thing? Perhaps it is best not to dwell on how it was likely used in the past. Key found in the Gutter. Intricately designed, but of unknown origin. All manner of terrible things have been cast into the Gutter in Majula, forming a settlement of filth and chaos. A small shield affixed with a black crystal. Found deep inside the Gutter, in the Black Gulch. Heavier than a standard small shield but the hard crystal boosts its defense against slashing. Some of the more determined souls exiled to the Gutter sought to scale the walls of the forsaken place and walk the earth once again, but failed, and wasted away mired in misery and resentment. A dagger affixed with a black crystal. Found deep inside the Gutter, in the Black Gulch. Heavier than a standard dagger, but with a fine crystal that gives it a smoother slice. Some of the more determined souls exiled to the Gutter sought to scale the walls of the forsaken place and walk the earth once again, but failed, and wasted away mired in misery and resentment.